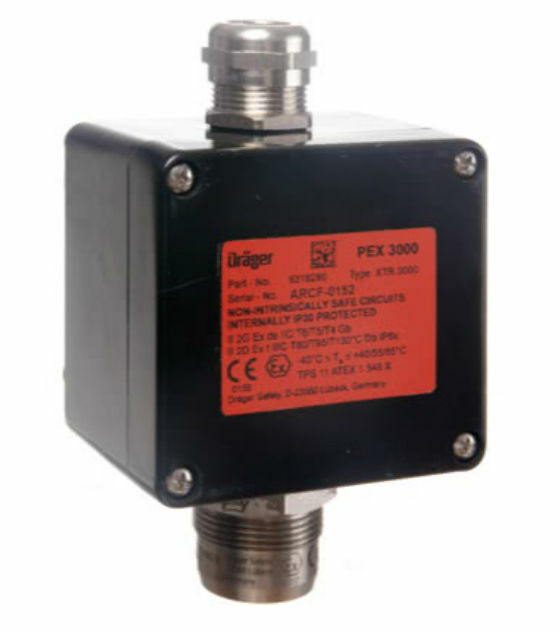 The transmitter Drager PEX 3000 detects flammable gases and vapors in concentrations below their Lower Explosion Limit. Its DD-sensor provides a very long-term stable measuring signal and responds to gas in only a few seconds. You can choose between two measuring ranges (0 ... 100 or 0 ... 10 %LEL) and two different junction box sizes. The larger junction box provides optional horizontal or vertical cable entry. Where the application asks for the sensor to be mounted remote from the junction box then it is possible to use the remote cable assembly combined with the sensing head of type Polytron SE Ex. The three core screened cable from the control system terminates within the junction box of the Drager PEX 3000 by means of three Ex-approved spring terminals. The sensor connects to three different Ex-approved spring terminals. Ex-approved spring terminals are not selfloosening and are inherently more reliable then standard screw terminals, therefore self-loosening is no longer an issue! Owing to the state-of-the-art design of the Drager PEX 3000 it is possible to open the Ex e junction box in the hazardous area to perform maintenance and calibration. Using the two internal push buttons and the internal seven segment digital display you can perform many different activities including one-man calibration. No additional hardware is required, e.g. a hand held terminal. The Drager PEX 3000 is approved according to the EU-Directive 94/9/EC to be operated at ambient temperatures ranging from - 40 up to + 65 °C. This applies to both explosive gas atmospheres and explosive dust atmospheres (Zones 1, 2, 21, and 22). For applications where it is necessary to detect low concentrations then the transmitters Drager PEX 3000 type XTR 0010 or XTR 0011 with their special low-drift LC sensor are very suitable. These transmitters reliably detect gas leaks of concentrations up to 10 %LEL. The new DD sensor is based on the well-known catalytic bead technology from Drager and is designed and manufactured by Drager for long term stability and resistance against sensor poisons. Furthermore, the new DD sensor uses an innovative non-sintered disc gas inlet therefore the reaction time towards the target gas in now only a few seconds. This fast speed of detection allows for countermeasures to be initiated earlier, therefore guarding against the formation of an explosive atmosphere.